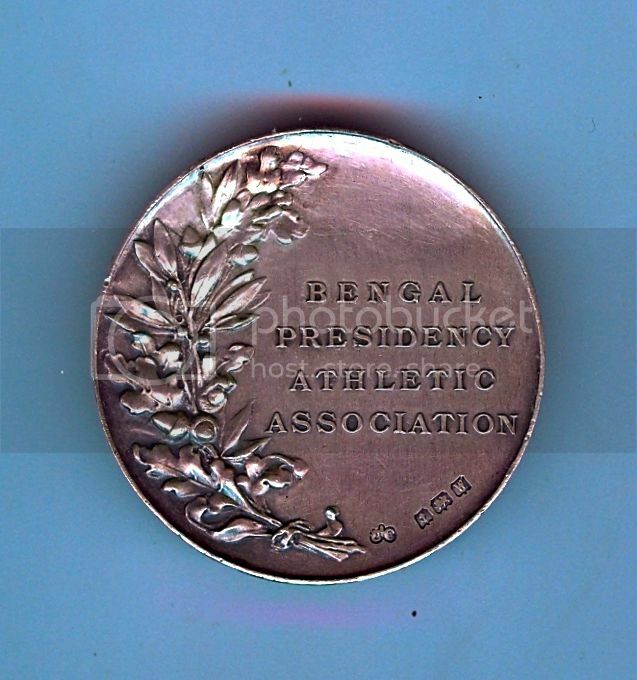 A small silver/gilt medal mounted with a gold domed overlay representing a football. Hallmarked WOL Birm 1918 (William Osborn Lewis). The outer edge inscribed B COY. 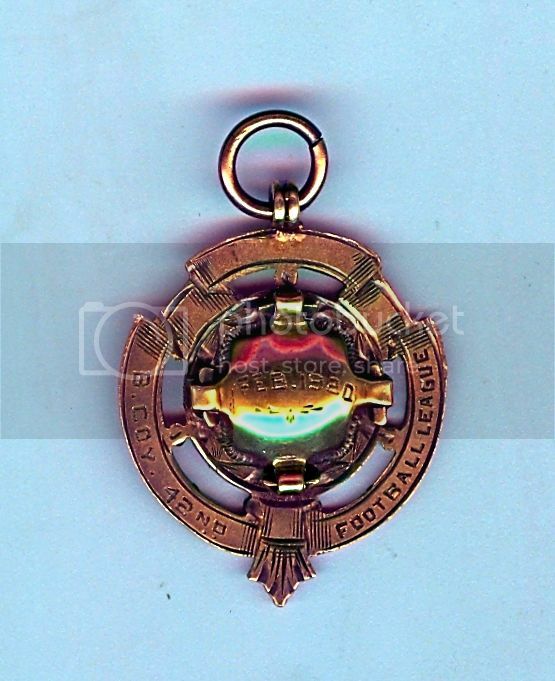 42nd FOOTBALL LEAGUE, The gold ball engraved Feb 1920. 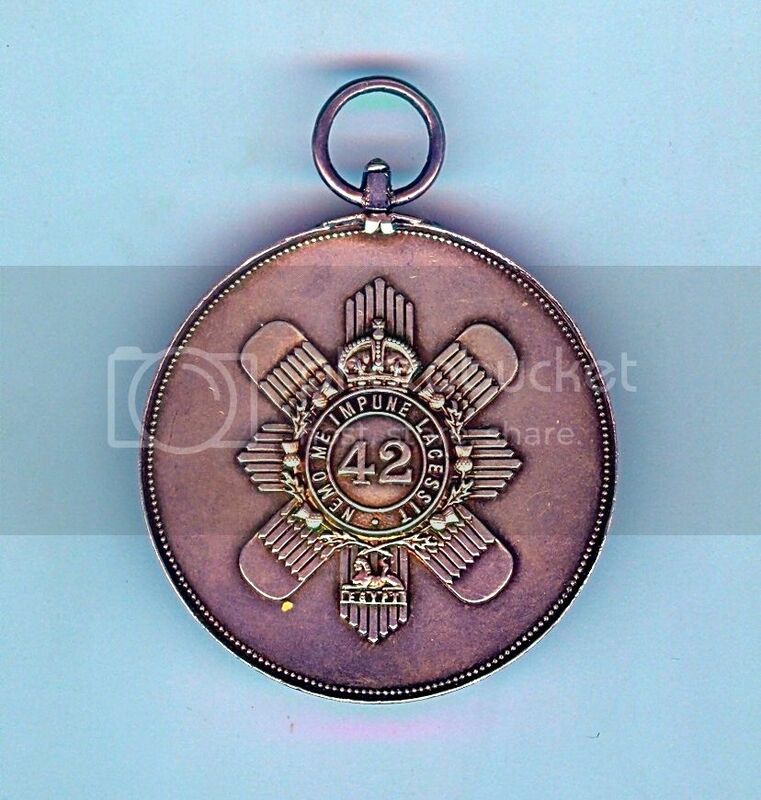 The reverse engraved SGT A BROWN. 30 x 35 7.3 gms. An unmarked silver/gilt Maltese Cross superimposed on a pointed saltire with trefoil shamrock terminals, further shamrocks at top of cross. To the centre a gold tablet inscribed CROSS COUNTRY 3RD 1021. The reverse engraved SGT.A.BROWN. Gilt worn off the cross. 42mm X 40mm 11.4gms. 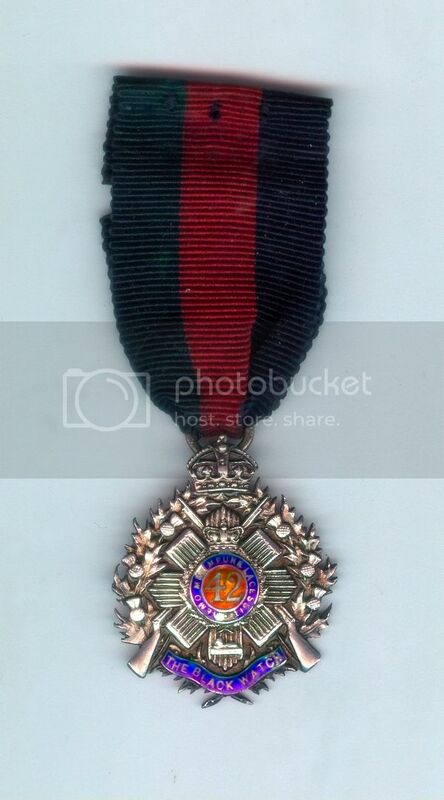 Silver/gilt and enamel medal with regimental ribbon. Hallmarked BN Birm 1921, gilt worn and chips to the enamel. 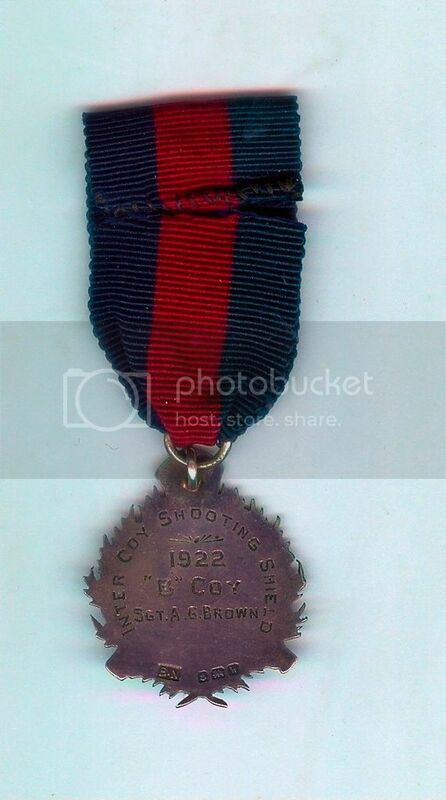 Inscribed to the reverse INTER COY SHOOTING SHIELD 1922 'B' COY SGT A.G.BROWN. 30mm x 35mm 8.09 gms. 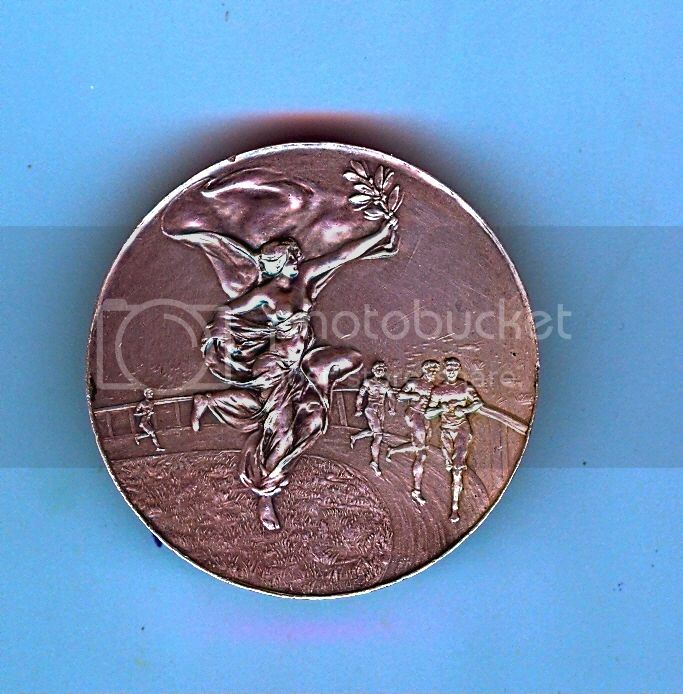 Large silver medal hallmarked W.O.L. Birm 1920 (William Osborn Lewis). The Royal Coat of Arms flanked by sprays of laurel above a tablet inscribed THE BLACK WATCH. 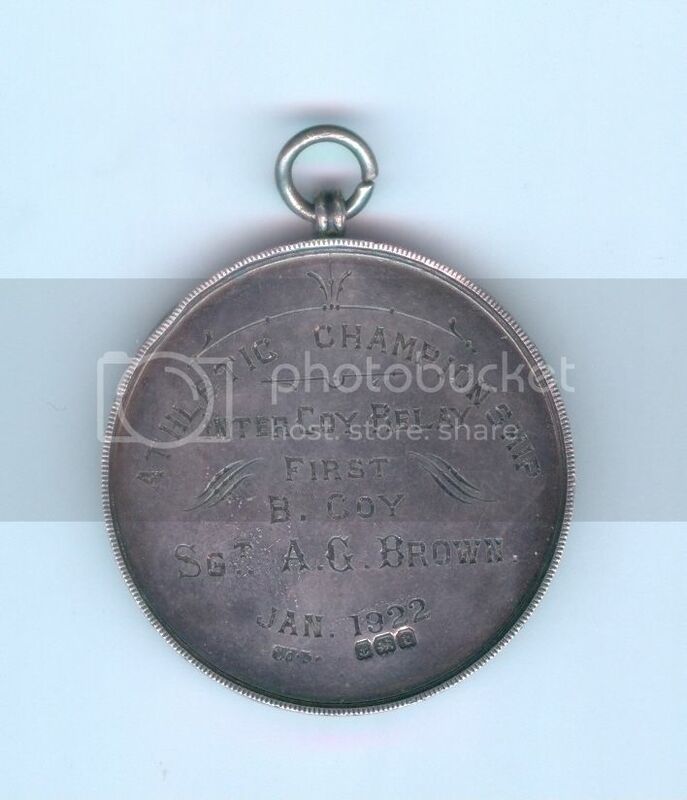 The reverse inscribed ATHLETIC CHAMPIONSHIP HALF MILE FIRST SGT A.G.BROWN JAN 1922. There is a raised milled rim both sides of the medal to protect against wear. 50mm diameter 37gms. Medium size silver medal hallmarked W.O.L. Birm 1918 (William Osborn Lewis). The Royal Coat of Arms flanked by sprays of laurel above a tablet inscribed THE BLACK WATCH. 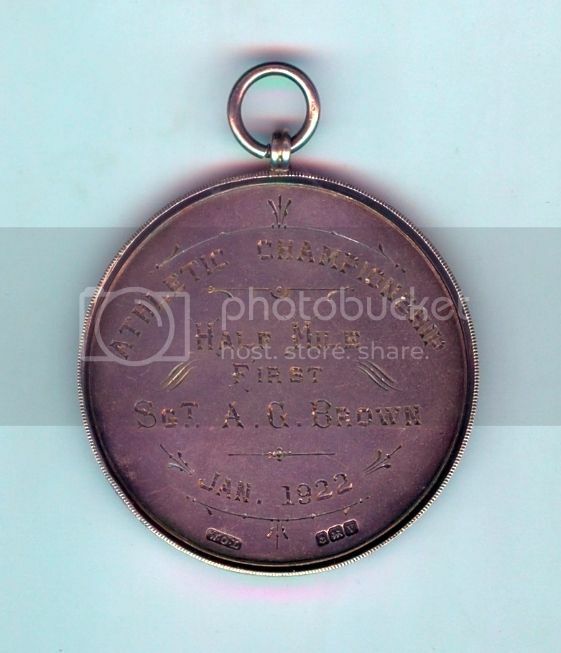 The reverse inscribed ATHLETIC CHAMPIONSHIP INTER COY RELAY FIRST SGT A.G.BROWN B COY JAN 1922. 40mm diameter 21.7gms. 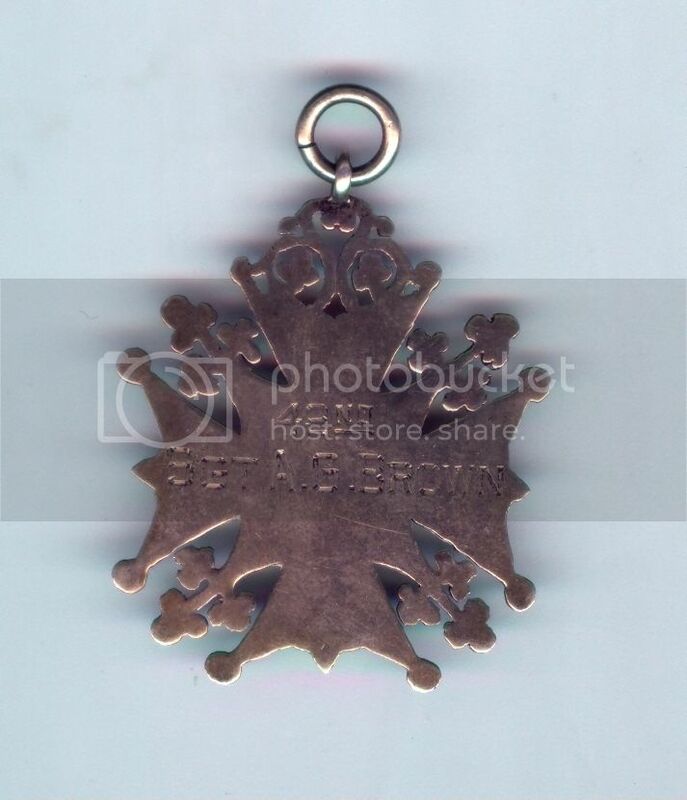 The last of A.G.Browns medals. 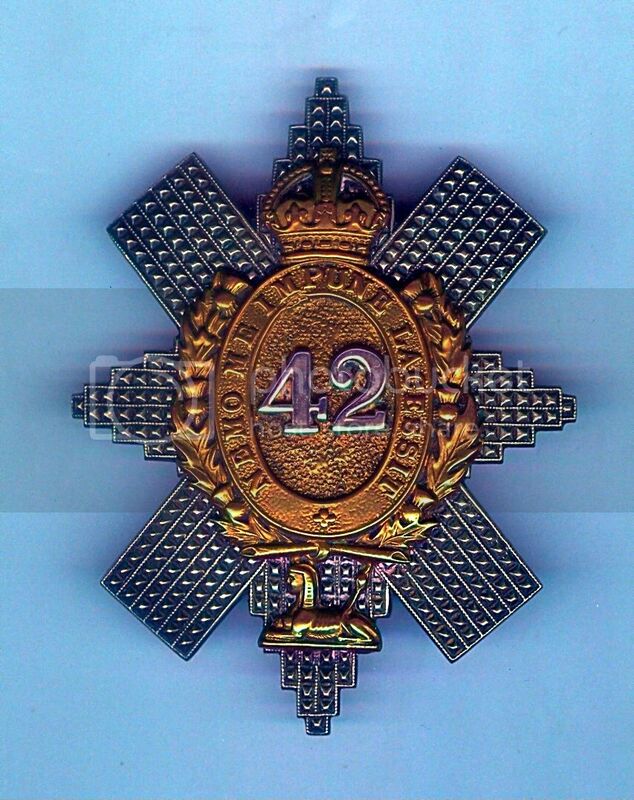 Large unmarked silver medal, regimental badge with 42nd numerals to the centre. 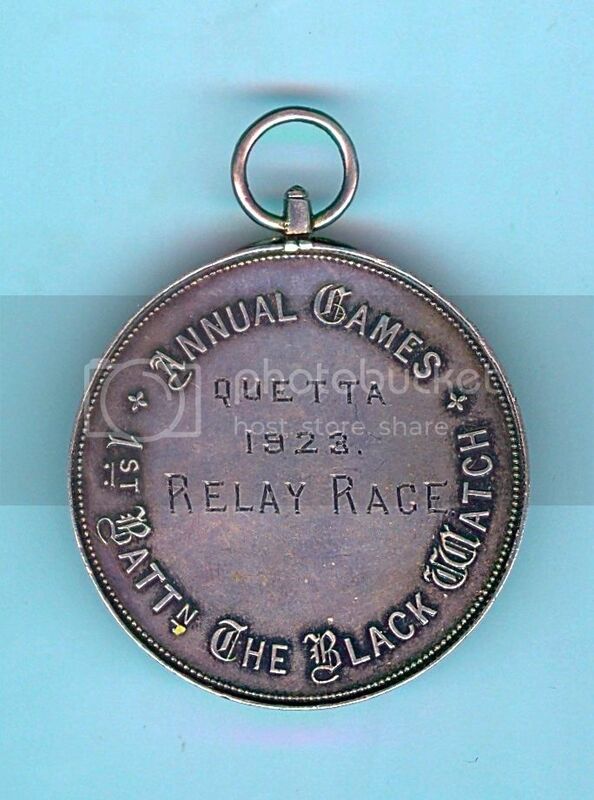 The reverse inscribed in raised letters ANNUAL GAMES 1ST BATTn THE BLACK WATCH, engraved to the centre QUETTA 1923 RELAY RACE. 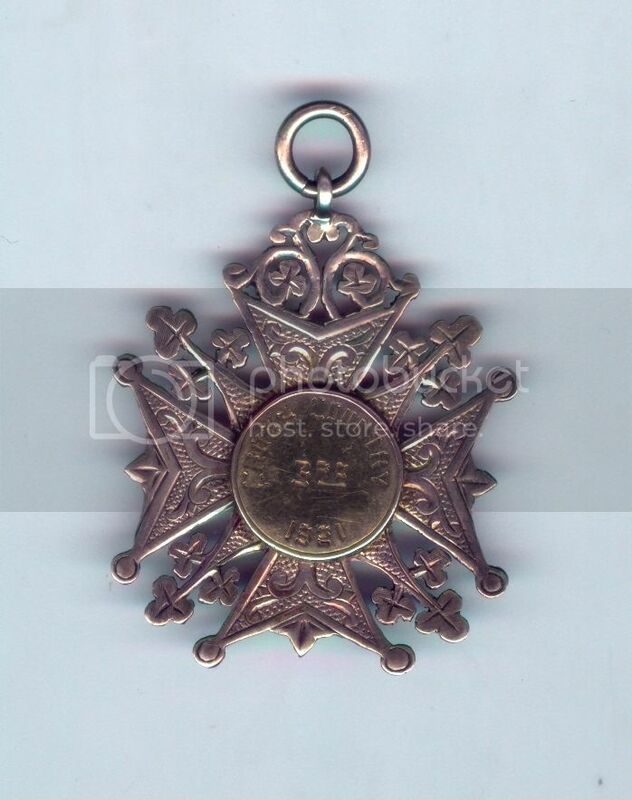 The medal has a raised rim both sides but is not milled. 45mm diameter 35 gms. 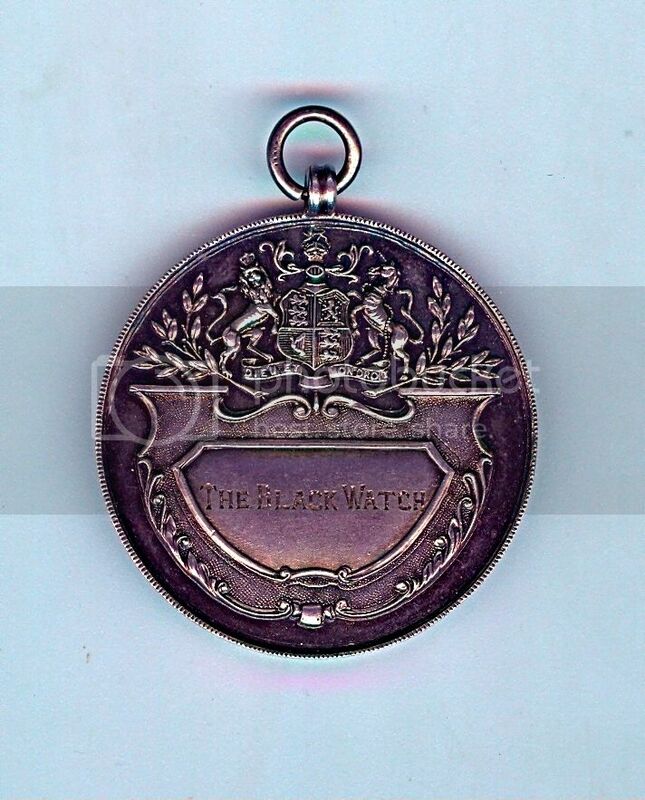 Ladies silk waist belt in Black Watch colours, buckle is a white metal regimental badge on sprays of thistles. 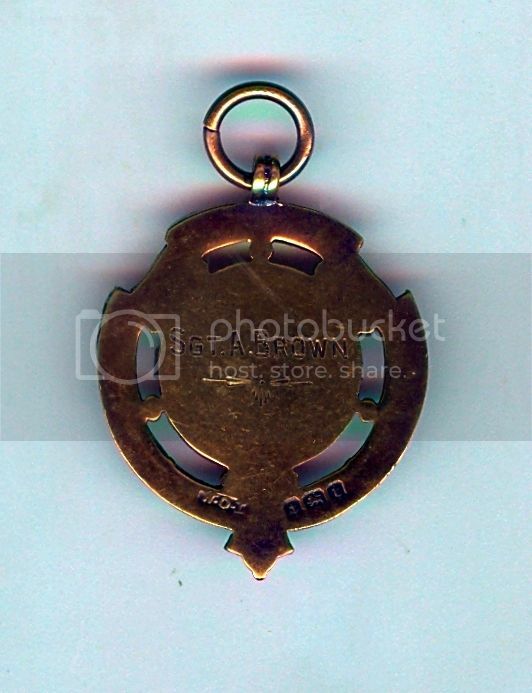 SNCOs 1st Bn glengarry badge 1936-52.
cotter pin holding overlay, white metal numerals polished. Last edited by ronmarsden; 2nd September 2016 at 09:31. That looks good Ron I would like one. How much would I have to pay if I seen one similar ?